Starting with the same Westside-inspired design as the popular Rogue R-4 Power Rack, the RML-490 utilizes 3x3" 11-gauge steel uprights—making it among the strongest and sturdiest power racks in the industry. Built in Columbus, Ohio, this highly customizable Monster Lite rack is equipped to serve professional strength training facilities, collegiate weight rooms, military training bases, and small garage gyms, alike. 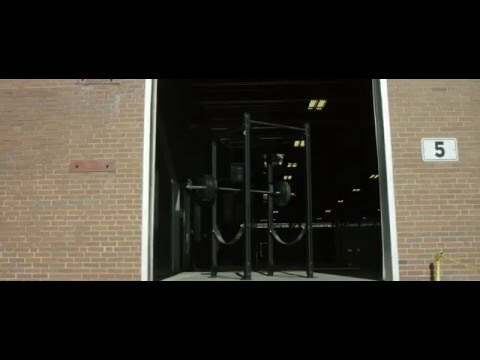 With the exclusive Froning Edition RML-4100C Power Rack, the Rogue team set out to create the ultimate, tailor-made CrossFit rack—featuring all of the unique elements preferred by the four-time CrossFit Games champion himself. The American-made RML-4100C shares the same core, Westside-inspired design as our RML-490C Color Racks—3x3” 11-gauge steel, 0.625" hardware, 43" beam crossmember—but ups the ante with taller 100” standard uprights (ft. the Rich Froning R* logo), a bare steel single pull-up bar for the best grip on high-rep workouts, and a killer, denim-black-matte powder coat finish unlike anything else in the industry. The unit ships with black zinc hardware and band pegs, and includes a complete 43” Monster Lite Strap Safety Set standard with each order. The back crossmember features laser-cut Rogue branding with a stainless steel back plate. Like all of our Monster Lite racks, the Froning Edition is also compatible with a wide range of add-ons and accessories for easy customization or expansion. See Also: Compatible accessories for the RML-4100C include the Monster Lite Matador, Monster Lite Safety Spotter Arms, Long Plate Storage, many more. Check out the official Rich Froning – Rogue Athlete page here. Important: Unit must be bolted to floor unless stabilizer is added. Mounting hardware is NOT Included. Rogue Froning RML-4100C Power Rack is rated 4.9 out of 5 by 11. Rated 5 out of 5 by Schmij22 from Awesome Rack I received this about a month ago. It is a tank. It’s built to last forever. I bought this edition mainly because it was cheaper all together then buying the rml 490 and upgrading to the safety straps and you get an extra 10” if you have the space to fit it. I didn’t buy the extra cross bar as i bought some weight storage mounts and it weighs the rack down a bunch. The stock pull up bar has pretty good grip. It took about two weeks to ship which was the worst part. Even though they say 2-6 weeks I was on their sight twice a day praying for updates on when it would ship. I can’t wait to add more attachments. Rated 5 out of 5 by Matt S from Top Quality Recent purchase, quality is impeccable, very pleased with this rack. Rated 5 out of 5 by RobCA from Very stout and extremely well built rack. I bought this rack to finish off my home gym build. The 100" height makes this rack perfect for me to kip pull ups as I am 6' tall. When you consider this has the height, west side hole spacing and safety straps (as opposed to pipe pin safeties) all as standard features, this is probably the best all around rack Rogue makes. I substituted the sandwich J cups for the originals and it was only a very slight up charge. The rack arrived packaged very well and was very easy to put together. I bolted it to the floor with the anchor kit from Rogue and it is solid and confidence inspiring. About the only drawback I can point out is the finish. The finish is very nicely done, however it seems to be a bit more prone to scratching and scuffing when compared to the standard Rogue powder cote. It's not an issue for me, just something in noticed. All things considered, this rack finished off my home gym build quite nicely. Rated 5 out of 5 by Charlie Durham from Great Rack I'll keep this short...the rack is worth every penny, easy to put together (I literally used the Rogue can opener/wrench and another wrench I had lying around the house...it took maybe 45 minutes solo), super solid, clean lines, great style and the right height for anyone trying to kip pull ups 6'0" or taller. Rated 5 out of 5 by Tobster from Well built! Very sturdy once bolted down Bought this on Black Friday 2016. Been using it for awhile now and love this thing! I didn't want to drill holes in my basement floor to bolt it down since I thought I may move it at some point. I had steel plates cut (60x12x½) drilled and tapped them ,then bolted the rack to them. It works perfectly and makes it very stable. This rack is top of the line in quality. Well worth the investment. Rated 5 out of 5 by Groovy from Great Rack - Love it I researched racks for months before deciding on this one. It's solid and does what I need it to do. It's well built and absolutely worth the price. The customer service reps at Rogue are fantastic. They proved invaluable to me when making my purchases. I purchased the shrimp trawler (for rings), kids pull-up bar, and plate storage. The only negative is the "R" logo plate on the unit is cracking and starting to peel. That's a bit of a bummer. I have no doubt Rogue would replace it if I were to ask. I think I'd probably purchase the same unit again, but without the logo. I'm still giving the unit 5 stars as I'm completely satisfied otherwise. Rated 5 out of 5 by Kevin M from Incredibly well made rack I bought this on Black Friday like the several other reviewers below. I didn't fully appreciate how well Rogue products were made until this arrived. It is super solid and was pretty easy to put together. The finish is really nice and smooth, unique for a product like this. I can't think of enough great things to say about this rack. There were a few bolts missing but customer service took care of it immediately. We added the stabilizer bar since we didn't bolt it to the floor. In addition, they upgraded the standard j-cups to the sandwich ones for a minor up charge. The additional accessories all work great on the rack (mono-lift, storage posts, and matador). I'm really happy with this purchase. This rack will last a lifetime.